Are your windows and doors prepared for a hurricane, tornado or any straight-sweeping winds? People living in the coastal areas, especially in Florida, should be prepared for a hurricane. They have stood a huge chance of suffering devastating losses in the event of a hurricane or tornado emanating from the sea. If you are one of them or perhaps if you would love to securely protect your home from burglars, do install impact doors and windows. They are proven to last and help guarantee the needed protection for an unforeseeable period. Windows and doors are your homes largest openings and are largely susceptible to wind damages, especially with regards to water seeping in. Securing and boarding up your windows might be the most popular way to prepare for a hurricane, but isn’t always the best if you need to solve the problem once and for all. That’s why you must install impact windows and doors. Impact resistant windows can withstand rapid hurricane force winds and are often more convenient than using shutters and plywood. Unlike plywood that has to be set up before the onset of the winds and later removed, impact windows are basically installed and used forever, including that moment when the rains are long gone. Moreover, this Polyvinyl Butyral (PVB) or Ethylene-Vinyl Acetate (EVA) reinforced glass windows are proven and trusted to function. There’s no way you can have impact windows installed in your home without ensuring impact doors are installed too. It is imperative to secure all openings, not only because it is part of the preparations, but also since impact doors last longer. With the right impact doors, you will never have to worry about securing your house again in the future, especially if you reside in a tornado-prone area. Impact doors and windows aren’t just your ordinary types of window systems; they are specially designed to withstand extreme wind forces and pressure and protect the house from the hurled missiles. And so, while shopping for some, to ensure that you understand the basic buying guidelines, including what to consider and how to choose them. Additionally, engage the seller or a reputable impact windows company Miami if you need one in Florida so that you can get the right assistance. Your preparations for the inevitable should also include checking to make sure the roof is ready and sealing any loopholes and joints between the sheathing panels. 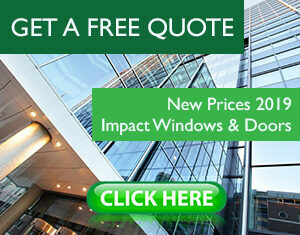 If you would need the best prices impact windows and doors installation in Miami, simply call Impact Window Center. This entry was posted in Impact Windows & Doors Tips and tagged fixed windows, horizontal rolling window, impact doors, impact doors miami, impact windows, impact windows and doors, impact windows florida, miami windows. Bookmark the permalink. ← Classicvue Max™ Aluminum SGD680. PGT Premium Sliding Glass Door.